Park Lodge Sekine is a traditional style family run Ikenotaira Onsen inn located in an historic former brewery building. Guests can feel like they have stepped into a time gone past but still with modern touches such as modern toilets and free wi-fi. 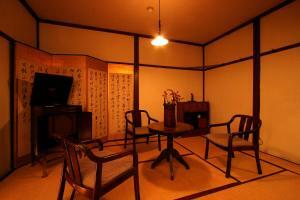 Each room is traditional style fitted with tatami flooring and futon mattresses. Bathroom (with natural onsen) and toilets are shared. An enjoyable and filling fresh homemade meal is available each evening in the large dining room featuring local specialties. Japanese breakfast is also served but western items may be available with advance request. Guests at this Ikenotaira Onsen inn can relax in the retro lounge room or large tatami space. Ski storage room is available on site. Colour-therapy and sound-therapy sessions are available with an advance reservation. Book Park Lodge Sekine in Ikenotaira Onsen now!